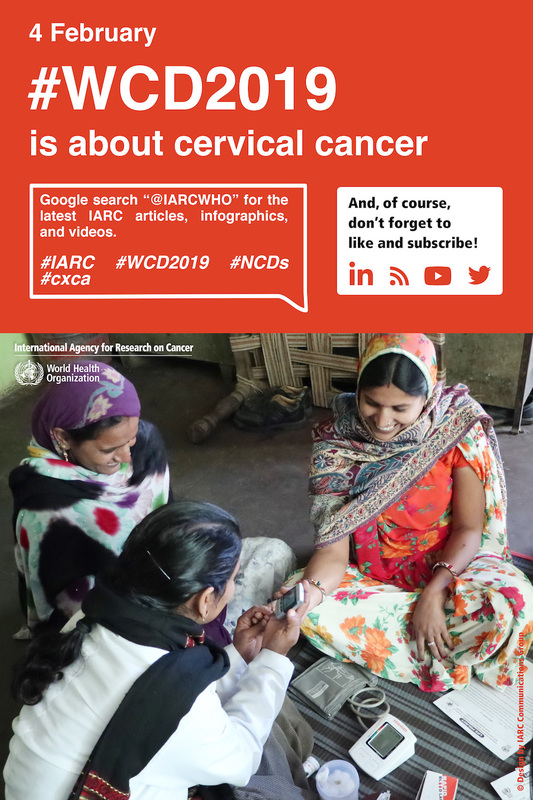 The International Agency for Research on Cancer (IARC) marks World Cancer Day 2019 with a full package of materials about cervical cancer. Explore below to see videos, interviews, and a showcase of some of IARC’s research projects related to cervical cancer. Between now and World Cancer Day (4 February), more content will be added, so stay tuned! 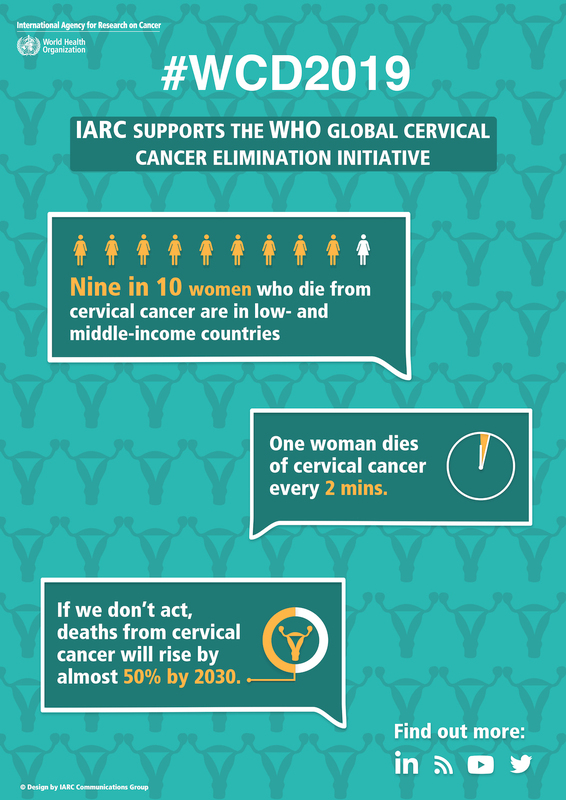 IARC is involved in a wide variety of projects around the world to evaluate, better understand, and prevent cervical cancer. 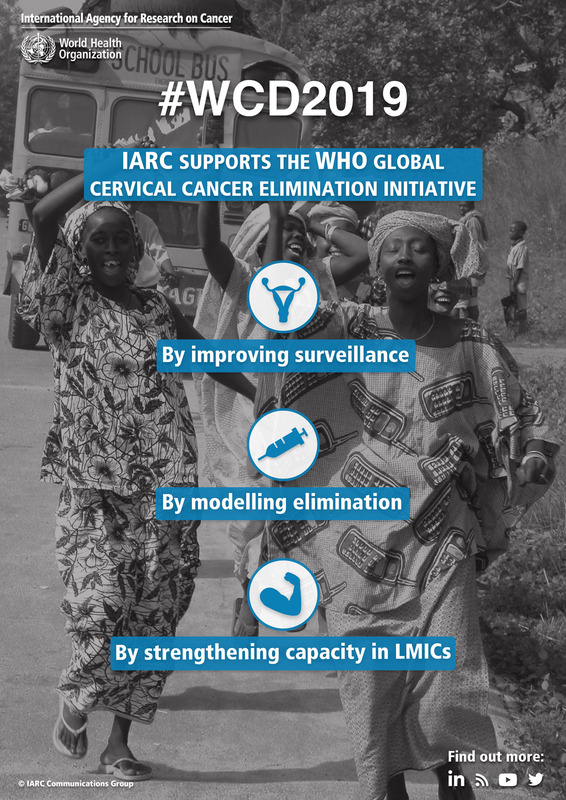 Working closely with its partner organizations, IARC coordinates studies on the efficacy, safety, and feasibility of primary and secondary cervical cancer prevention techniques, for example by evaluating the efficacy of human papillomavirus (HPV) vaccination programmes or comparing the efficacy of cervical cancer screening using cytology (Pap smear) or HPV testing. IARC also provides technical support to cancer registries in low- and middle-income countries in order to better estimate the global cancer burden. In Pune city, Maharashtra, India, IARC has provided technical support to an innovative cancer cervical project run by Prayas, a local nongovernmental organization. A specially equipped van visits areas of the city so that women with limited access to health services can benefit from cervical cancer screening and treatment. In India, IARC is conducting research to better understand the causes of cervical cancer and to evaluate the most appropriate prevention strategies, diagnostic tools, and treatments to control the disease. In Pune district in Maharashtra, IARC is working closely with national institutions to evaluate the efficacy of fewer than three doses of HPV vaccine in protecting women against cervical cancer. The ESTAMPA study is an IARC-led international research project in Latin America to evaluate approaches to organized HPV-based cervical screening and reduce cervical cancer mortality in the region. Breast cancer, oral cancer, and cervical cancer are the most common cancers in India. IARC has partnered with GBH American Hospital, Udaipur, to develop an innovative comprehensive model to screen people for common diseases and educate them about noncommunicable diseases such as diabetes, hypertension, breast cancer, oral cancer, and cervical cancer. If successful, the model could be used in other places where access to services is limited. IARC strives to reduce the burden of cancer by developing screening programmes for real-world conditions, recording incidence data to inform policy, researching cancer biomarkers through genetic sequencing, and a host of other projects. Some of IARC’s collaborators explain how working with IARC helps them to reach this goal. Dr Carolina Wiesner of the National Cancer Institute of Colombia describes the IARC-led ESTAMPA study in Latin America, which evaluates cervical cancer screening and triage methods. The study also assesses the challenges of implementing such screening programmes, and offers proposals to help establish them in different scenarios. Dr Laura Mendoza of the National University of Asunción, Paraguay, presents the ESTAMPA study, which aims to reduce deaths from cervical cancer. IARC is coordinating the study in 11 countries in Central and South America. The study enables countries to assess new screening programme models and gives researchers greater access to international training and networks. Dr Gilles Travé of the Institute of Genetics and Molecular and Cellular Biology in Strasbourg, France, gives an overview of his work on the structure of proteins related to tumour-causing viruses and how he collaborates with IARC to explore the potential carcinogenicity of new papillomaviruses. Dr Matti Lehtinen of the University of Tampere, Finland, notes how IARC models were used and validated in Finland to determine the most feasible approach to reducing the HPV burden. This is important for high-income countries as well as low- and middle-income countries in designing HPV vaccination programmes. Dr Ashrafun Nessa of Bangabandhu Sheikh Mujib Medical University Hospital, Bangladesh, discusses the challenges of addressing cervical cancer, which is responsible for one quarter of cancer deaths in Bangladesh, and explains how the government is tackling the disease and how IARC is helping with the project. On World Cancer Day 2019, the 6th International Agency for Research on Cancer (IARC) Cancer and Society Lecture will be presented by Groesbeck Parham, MD. Dr Parham is a professor in the Department of Obstetrics and Gynecology at the University of North Carolina at Chapel Hill, USA. His lecture, “Catalysing a shift in cancer control in a low-resource setting by using what’s available”, will be live-streamed on the IARC website at 11.00–12:00 Lyon time (CET) on 4 February 2019. With his team, Dr Parham was among the first to provide cervical cancer screening and treatment services on a broad scale to HIV-positive women in sub-Saharan Africa. A leader in cervical cancer prevention in resource-constrained settings, he has collaborated closely with the Zambian Ministry of Health to develop strategies for human papillomavirus (HPV) vaccination countrywide, including a pilot programme to vaccinate 25 000 girls through a school-based approach. Dr Parham is an adviser to major public health organizations and campaigns, such as the World Health Organization (WHO), the Joint United Nations Programme on HIV/AIDS (UNAIDS), the United States President’s Emergency Plan for AIDS Relief (PEPFAR), and the Pink Ribbon Red Ribbon initiative led by the George W. Bush Institute. Dr Parham collaborates with IARC on projects to study disparities in breast cancer outcomes and new cervical cancer prevention techniques in low- and middle-income countries. Dr Parham describes his projects in low-resource settings. What projects are you are currently working on? 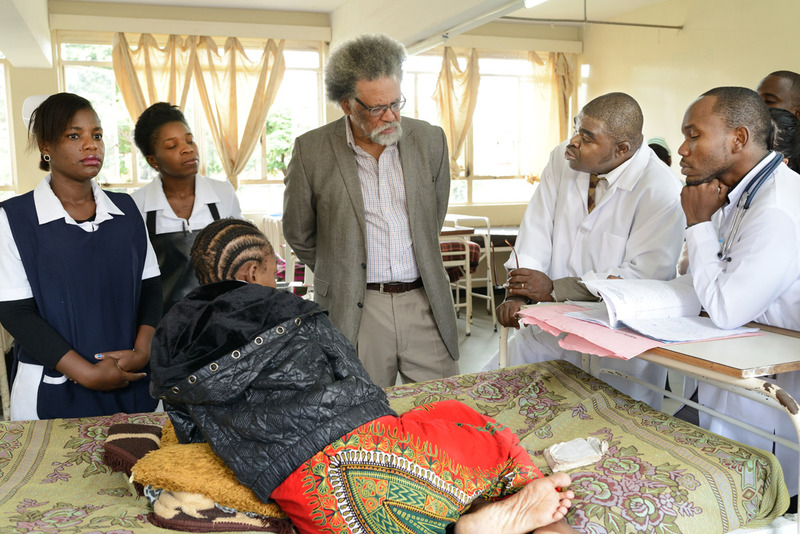 Our clinical research team in Zambia is collaborating with investigators from the United Kingdom and France to test new approaches to improving cancer care in resource-constrained settings. We are examining the use of virtual reality simulations and gaming technology to enhance and accelerate the surgical training of young gynaecologists. This is funded by the United Kingdom Medical Research Council and is being led by Professor Richard Sullivan of King’s College London. We are also evaluating the implementation of a low-cost, battery operated device that uses heat to destroy precancerous cells on the cervix. This is led by IARC scientists Dr Partha Basu and Dr Walter Prendiville and is funded by the United States National Cancer Institute. How are your projects addressing the needs of health care professionals and patients in resource-constrained settings? According to the Lancet Commission on Global Surgery 2030, fewer than 25% of patients in low-income countries have access to safe, affordable, and timely surgery. In reality, many patients end up dying without ever being treated. The major objective of the virtual reality clinical trial is to determine whether a simulation platform, constructed using low-cost computer equipment, can improve the surgical proficiency of novice surgeons in Zambia. Improvements in technology are also under investigation in the second trial. One of the major barriers to the expansion of cervical cancer prevention in settings of extreme poverty is the expense associated with the equipment that is used to treat precancerous lesions of the cervix once they are detected. There is a critical need for treatment devices that are not only effective but also portable, low-cost, and easily used by non-physicians. By evaluating these properties in a new device and comparing results to standard methods of treatment, we can find options that could offer solutions to people living in remote, poor, or underserved areas. What are the next steps needed to improve cancer control and patient outcomes in these areas? There are three things we can do right now. Firstly, we can introduce massive grass-roots education campaigns about the nature of cancer as well as how it can be prevented and treated. Secondly, substantial financial investment is required in prevention, treatment infrastructure, and management systems. Finally, by using expert advice to correctly implement the things we already know in a comprehensive and extensive way, we could make a huge difference to cancer control, greatly improving patient outcomes. For World Cancer Day 2019, the International Agency for Research on Cancer (IARC) has invited Dr Eva Kantelhardt to present a seminar on her work. Her presentation on “Breast cancer health service in Ethiopia: insights from cancer registration to long-term care” will be live-streamed at 14:00–15:00 Lyon time (CET) on 4 February 2019, World Cancer Day. IARC asked Dr Kantelhardt for an overview of her projects and the impact they are having. Our current projects on breast cancer focus on the unique breast cancer biology in Africa, the implementation of endocrine treatment, and optimizing patient referral linkage – the process of ensuring that people who screen positive for disease receive treatment and follow-up. A population-based trial comparing different methods of cervical cancer screening, which evaluates uptake of screening and adherence to procedures among other aspects, is also under way. 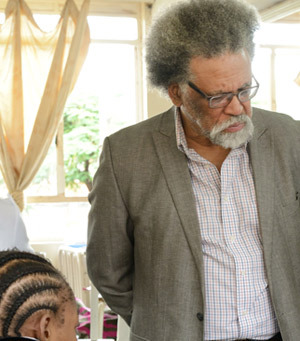 The Addis Ababa City Cancer Registry, a population-based registry that has been active since 2012, is a project that is run in close collaboration with the AFCRN and IARC. Apart from hospital-based outcome studies, we are also interested in cancer care in rural areas. What are the main challenges you and your colleagues face in areas where health services are limited? There is a serious lack of trained staff, such as oncologists and surgeons. Health services and patients have limited financial resources. The need for interdisciplinarity, closer communication, and improved links between cancer care institutions also presents specific challenges. How do your projects address the needs of health care professionals and patients in underserved areas? 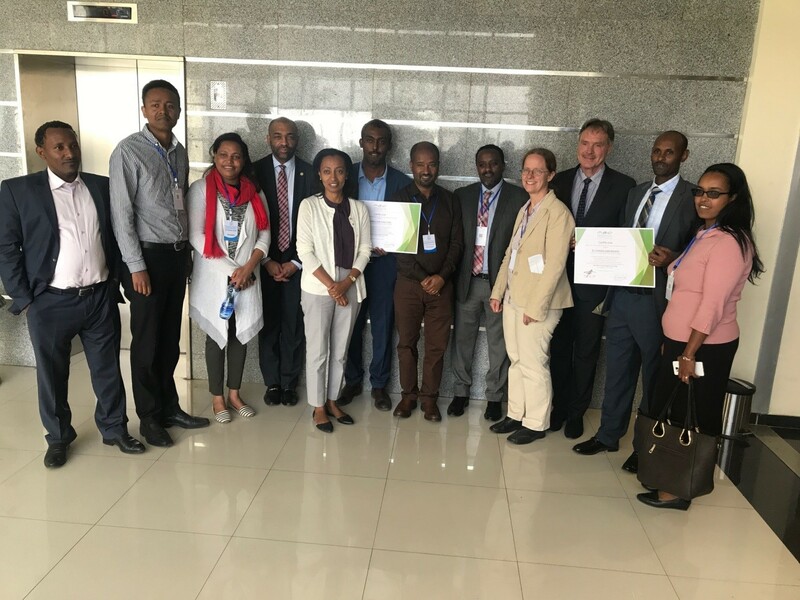 We have implemented a training programme for gynaecologic oncologists in Ethiopia, increasing the number of these specialists in the country from 2 to 6, with another 10 in training. These gynaecologists each perform about 10 major abdominal surgeries for ovarian, cervical, or vulvar cancer every week. To improve laboratory capacity, we have trained five colleagues in human papillomavirus (HPV) testing and determination of breast cancer hormone receptor status. This has allowed about 3000 women to be screened for cervical cancer and about 10 000 to be screened for breast cancer, and about 1500 breast cancer patients have received information on their hormone receptor status. Projects like this serve patients in need by providing endocrine treatment for breast cancer patients at no cost, and by increasing the capacity for cervical cancer screening. Since 2014, we have been supporting lectures and continuing medical education sessions on gynaecologic cancer at the annual meetings of the Ethiopian Society of Obstetricians and Gynecologists, and since 2012 there have been annual oncology conferences. Our projects have also supported 15 oncology residents in their mandatory final-year research, 10 of whom have now graduated. 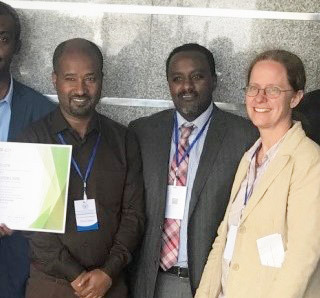 A total of 25 German MD students, about 20 Ethiopian master’s students, and 10 Ethiopian PhD candidates have been jointly supervised and supported financially to perform research on cancer in Ethiopia and other African countries. Improved cancer data assist members of the AFCRN, part of the IARC-led International Association of Cancer Registries, who also collaborate with the American Cancer Society. Together with the Addis Ababa University School of Public Health, we have developed a curricular module on noncommunicable diseases, including cancer, for master’s students there. This will ensure improvement of health services in rural areas and primary health care services overall. What are the next steps needed to reduce disparities and improve patient outcomes in these areas? The main driver for success seems to be political commitment. Investments, such as in radiotherapy, can only come from governments. Cancer control programmes must guide an interdisciplinary approach, including all levels of health service. Downstaging – the ability to decrease the size or number of cancerous tumours at diagnosis to a less threatening stage – and access to guidelines to standardize therapy will also hopefully improve outcomes for patients. Dr Bruce Armstrong, Senior Visiting Scientist at IARC and “arguably the most outstanding public health scientist in the history of Australian epidemiology” according to the Australian Academy of Science, sat down with us to explain how Australia has achieved one of the world’s lowest incidence rates of cervical cancer, to explain how other countries can reduce their own burden of cervical cancer and to share his message for World Cancer Day 2019. To more fully understand the success we see in Australia today and help other countries achieve similar results, it is important to look at the history of cervical cancer control in Australia. A willingness to implement innovative techniques in the past is leading to promising results in the present. From the key role played by Australian scientists in discovering that human papillomavirus (HPV) was the main cause of cervical cancer to the involvement of Australian researchers in the development of a vaccine, Australia has long been at the forefront of the movement to eliminate cervical cancer. As well as work on primary prevention techniques related to HPV and vaccination, Australia was also a pioneer in secondary prevention techniques, adopting the 1986 IARC and WHO guidelines and implementing an organized national approach to cervical screening using the Pap test. By actively inviting women for tests and sending reminders to women who did not re-attend or who had abnormal results, Australia succeeded in covering 70% of the target population every three years. Australia has continually taken measures to effectively prevent cervical cancer, offering a model for other countries to follow. HPV vaccination programmes for girls, and more recently boys, as well as the introduction of HPV testing as part of the National Cervical Screening Program, are all contributing to the likelihood that Australia will be the first country to eliminate cervical cancer as a public health threat, perhaps as early as 2035, thus showing that elimination is possible and giving hope to women in low- and middle-income countries, where cervical cancer is currently the third most deadly cancer among women and a serious threat to public health.